Above: Breathtaking views from the Borubai Project, which overlooks the neighbouring Taldybulak Levoberezhny Gold Mine, owned by Zijin Mining. 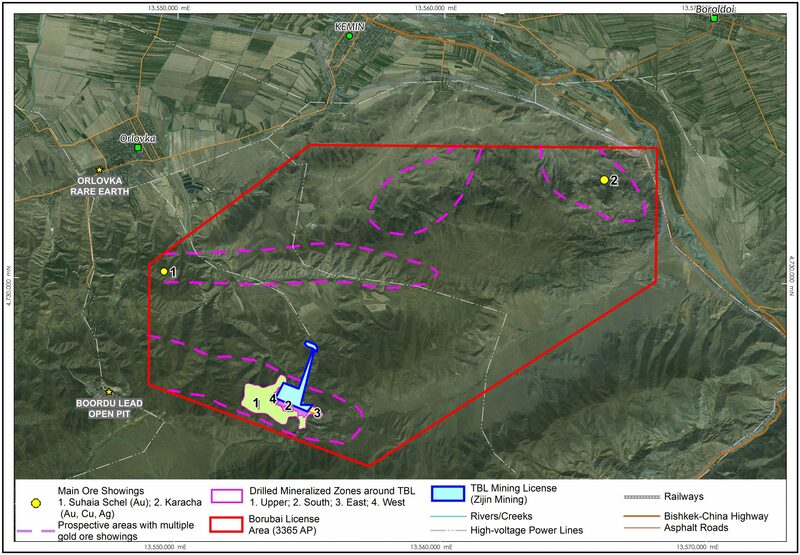 The Borubai gold project is located in the Kyrgyz Republic in Central Asia. 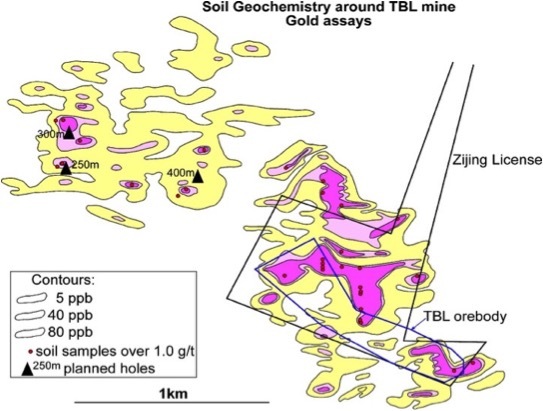 Kenadyr Mining holds 100% interest in the 164km2 Borubai Exploration License, which encircles Zijin’s Taldybulak Levoberejnyi Mine (TBL Mine), a newly built and producing mine containing 3.2 million ounces in reserves and resources at a grade of 7.2 g/t. The Borubai Project has had 81,800 meters of historic drilling and is only 100 km away along a major highway from Bishkek, capital of the Kyrgyz Republic. The area has well developed infrastructure with 2 lines of high-voltage power grid and access roads to all prospects. The license is at foothill area with low altitudes above sea level providing easy year-around operations. The project area lies 100 km away along a major highway from Bishkek, capital of the Kyrgyz Republic. The area has well developed infrastructure with 2 lines of high-voltage power grid and access roads to all prospects. The license is at foothill area with low altitudes above sea level providing easy year-around operations. 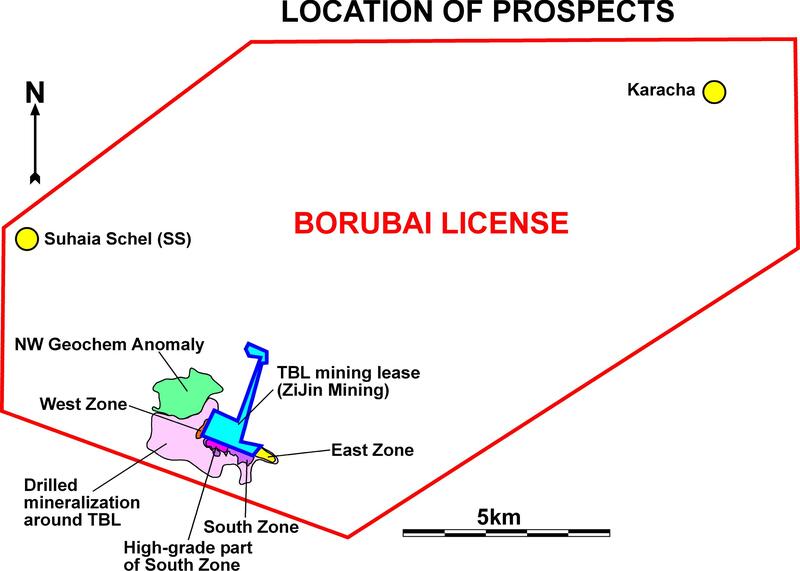 The Borubai License has an area of 164 square km (Fig. 1-2) and during Soviet times (pre 1991) was subject to extensive drilling (98,200 m in 184 diamond drill holes with complete assays), trenching (13,800m3), bulldozer cuts (33,400 m3), geologic mapping at 1:25,000 and 1:50,000 scales, ridge and spur and grid soil geochemistry for multi elements (14,200 samples), rock geochemical sampling (2,320 samples), pan concentrate sampling (790 samples), and 100 meters of adits and 184 meters of underground raises. The entire area has also been subject to airborne magnetic, radiometric and gravity surveys, as well as ground based resistivity and IP surveys conducted by the Soviet Government. Soviet drilling outlined the TBL Mine’s gold resources and established that the mineralization continued on to the Borubai licence. High Grade South Zone alone contains a historic unclassified Soviet Resource Estimate of 900,000 oz. Au @ 8.3 g Au/T, based on a 4 g Au/T cut off. A large coincident gold geochemical anomaly and IP anomaly to the Northwest remains untested by drilling. *Historic Estimates. Non NI43-101 Compliant. Not to be relied upon. The Borubai License is located in the Northern Tian Shan orogenic belt of Central Asia in the Aktyuz-Boordu Metallogenic Province. This area is characterized by structures associated with the Baikal and Caledonian Orogenies, which are intruded by Middle to Late Paleozoic igneous rocks associated with the gold mineralization. The main rock types in the project area are Lower Proterozoic amphibolite, gneiss and mica schist intruded by a sub-volcanic complex of Carboniferous to Permian (C3) diorites to monzonites, which are considered to be almost synchronous with mineralization and genetically and spatially associated with it. Early Paleogene dolerite dykes intruded all earlier units. (Seltmann R and Porter T M, 2005). The mineralization is associated with pyrite and preferentially hosted in metasomatic quartz-tourmaline, quartz-carbonate-fuchsite and quartz-sericite rock developed in crystalline schists, gneisses, breccia and gouge. The deposit type can be described as structurally hosted (within shear zones); intrusive related (Carbonaceous-Permian dioritic to monzonitic dykes and sills); quartz-carbonate-sericite metasomite; with quartz-tourmaline-pyrite-gold mineralization. Structurally, most of the is localized in a shallow-dipping, moderately folded, Proterozoic ductile shear zone on which brittle extensional deformation was overprinted during the Hercynian dilatation event. The shear zone is conformable with schistosity and banding of the hosting schists and gneisses. The high-temperature metasomatic alteration was overprinted onto tectonic breccia and gouge. 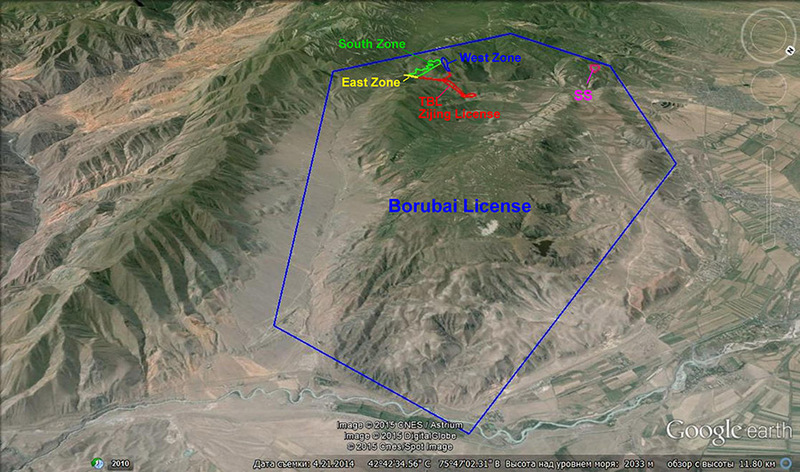 The brittle-ductile shear zone containing all known deposits in the area extends all over the Borubai License. In all locations where this zone comes close to surface it is manifested by gold mineralization and/or gold geochemical anomalies. 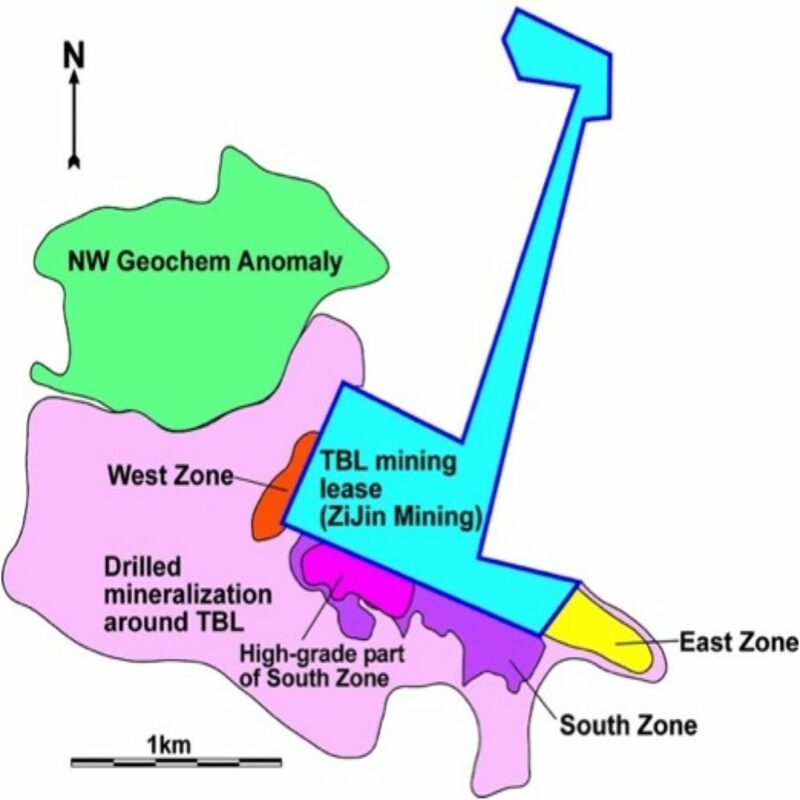 The mineralization at the South and East Zones is identical to the mineralization at the TBL Mine and is believed to be a continuation of the TBL mineralisation currently being mined by Zijin. It is hosted mainly by a unit of highly altered schist and gneiss dipping at 35 to 40 degrees to the south-southwest. 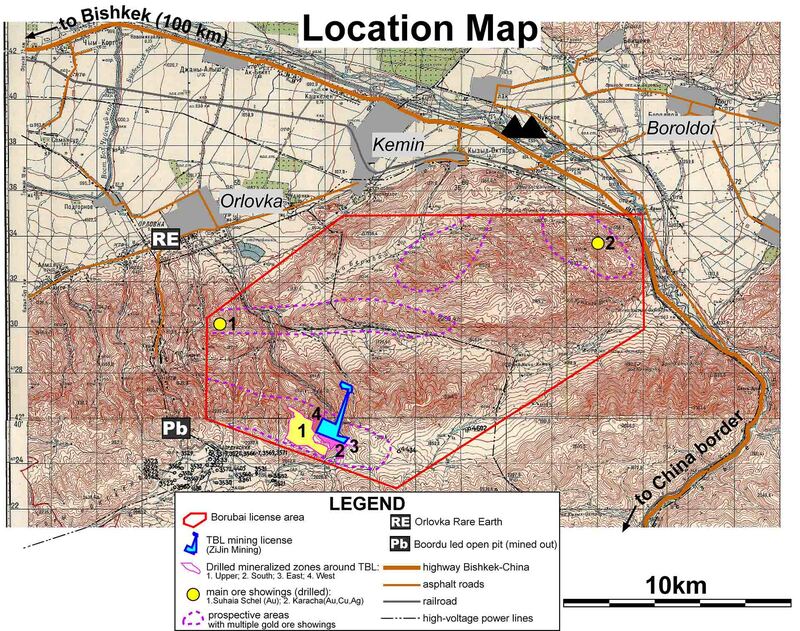 “The Borubai southern and eastern ore zones and the TBL deposit comprise en-eschalon tabular mineralised zones within a 200 to 300 m thick tabular ‘melange zone’ which represents one of a series of ‘crush zones’. The crush zones appear to occupy the thrust contact between the Palaeoproterozoic mafic and felsic suites. The ‘melange’ comprises highly altered rocks that dip at 35 to 40° to the southwest and can be traced for 1.2 to 1.5 km along the southwestern limb of a large antiform. Gold mineralization is comprised of quartz-sericite, quartz-carbonate and quartz-tourmaline metasomite associated with monzonite and diorite porphyries. The mineralization is intimately associated with structural faults and tectonic breccia within a conformable extensional detachment zone. The main gangue minerals in the mineralization are quartz (45% to 60%), muscovite or sericite (up to 55%), carbonates (up to 30%), tourmaline (up to 40%), fuchsite (1% to 5%) and other chlorites (up to 10%). Less common minerals include barite, fluorite, apatite (0.1% to 1%), feldspar (albite, K-feldspar), epidote, pyroxene, amphibole, garnet, and traces of topaz, depending on the variation of rock types and the occurrence of mineralization. Kenadyr’s Borubai project fully encircles Zijin’s TBL mine, with Soviet drilling having shown that mineralization extends onto Kendayr’s property. In the South Zone, high-grade mineralization extends along the South border of Zijin’s TBL license. An unclassified Soviet resource (Non NI43-101 compliant) of 900,000 oz Au @ 8.3 g/t (using a 4 g/t cut off) has been estimated in this area based on 24 holes. In the East Zone, gold mineralization was intersected at shallow depth by both Soviet drill holes and an adit driven from the TBL deposit. 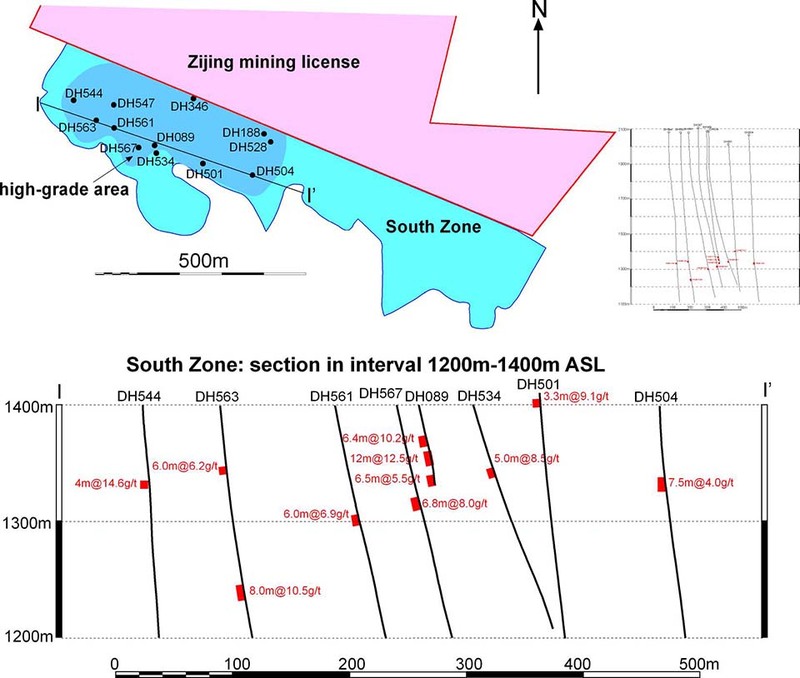 In the West Zone, gold mineralization that was intersected in 11 Soviet core drill holes extends over 500 metres. The Borubai project has the potential to increase the size and the grade of the mineralization (from historic numbers) due to increased core recovery and modern drilling and assaying techniques. Soft mineralized material was preferentially lost during Soviet core drilling, resulting in poor core recoveries (40% to 85%; averaging 60%). 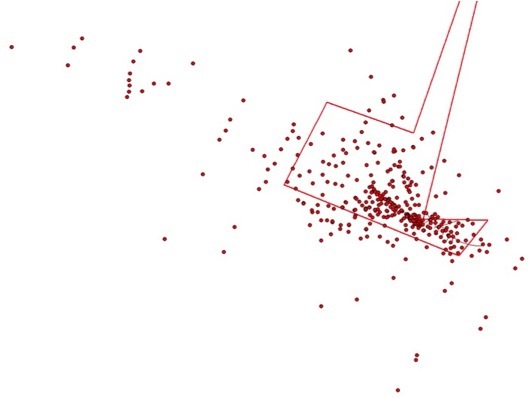 Further, the use of predominately ICP analysis (versus fire assay) may have understated the resources and grades at the South and other zones. 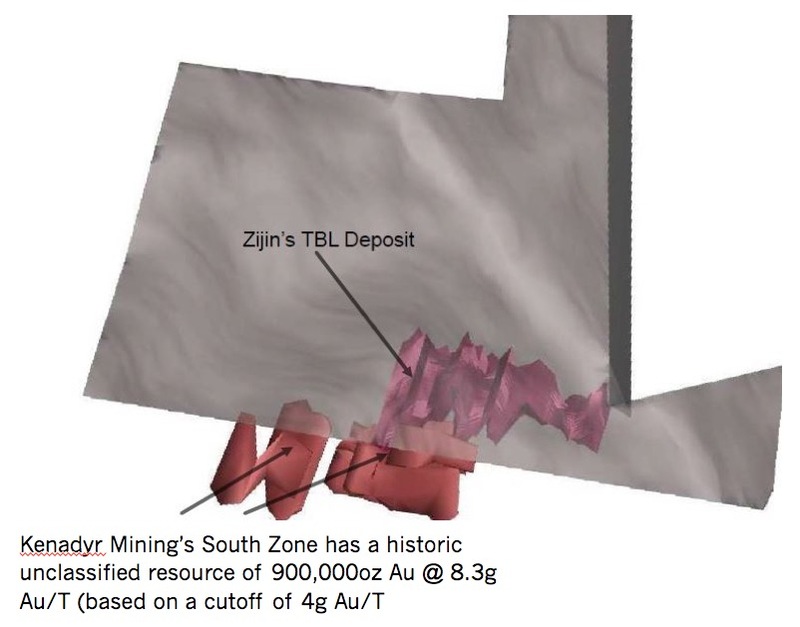 Subsequent drilling at Zijin’s TBL mine by Malaysian Mining Corp produced higher core recoveries (>95%) and higher gold grades. (See table for comparisons in Maps & Diagrams section). Additional high grade gold targets exist through out the Borubai license. 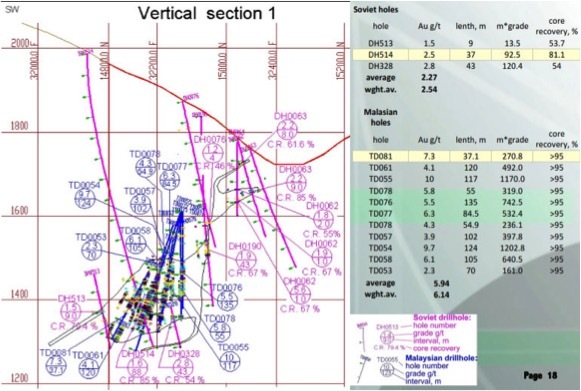 The entire license has been subject to extensive geochemical and geophysical surveys, with follow up trenching and drilling on only a few of the identified anomalies. Two previously drilled on-surface prospects (Suhaia Schel (SS) and Karacha) are immediate additional drill targets.